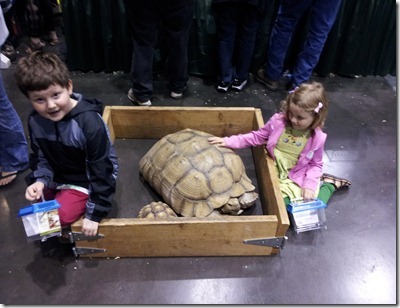 The 2011 Sacramento Reptile Show is being held once again at the Sacramento Convention Center and is officially sponsored this year by PET’SMART. The really cool part about this show is that if you visit Upscale Reptiles website, they have a coupon for $1 off a ticket for admission. PET’SMART has a special coupon for $3 off the price of admission and is good for up to four tickets per coupon. The show runs Saturday, October 29, 2011 10am until 5pm through Sunday October 30, 2011 10am until 4pm. 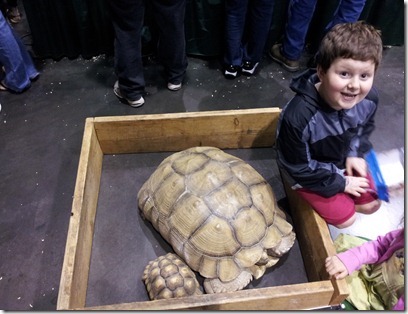 Besides vendors selling animals, there are private collections on display of amazingly healthy captive exotics from alligators to Sulcata tortoises. Admission is $12 for 13 and older, 6 to 12 year cost $8 and children 5 and under are free. The box office only accepts cash! I am really baffled by the reality that in this modern age that a city owned venue like the Sacramento Convention Center would only accept cash at their box office. Especially considering that the ATM in the lobby of the venue charges $5 per transaction to get cash. There is a bank located at the end of the block diagonally opposite the Box Office that has an ATM that only charges $3 and there is a Credit Union located across the street from the Box Office. Today was just not my day for being financially savvy as I seemed to make several mistakes that will cost me between $10 and $15 in regards to this show. The first was not noticing the credit union across the street and using the bank ATM that charged me $3 in fees. Patelco, the credit union I use instead of a bank will also charge me a small feel as well has reciprocal agreements with most other Credit Unions to share their ATMs fee free. Add to that Kethry is 5 and I paid for a child ticket for her. Rachel got me a PET’SMART Discount coupon so the total cost of the entry was $19, I paid an additonal $5 for Kethry. Actually, I do not mind this really as in this case the ticket price goes to help Upscale Reptiles pay for the use of the Venue. Since I love the show, I don’t mind paying for it really, I just hate the mindless bank fees. So Rachel, got in for free since she is actually working the PET’SMART booth at the show. The three of us, Haplo, Kethry and I all won small Kritter Keepers on the Prize Wheel! 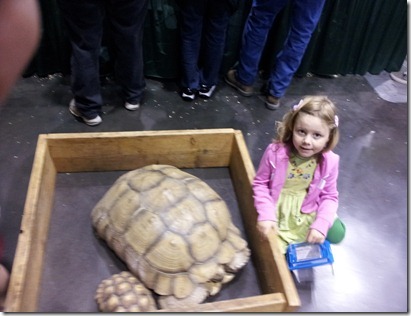 We walked around looking and the show is dominated by Snakes and Tarantulas with a healthy assortment of lizards and turtles thrown in. There were some frogs, but not nearly enough for this Frog Lover. 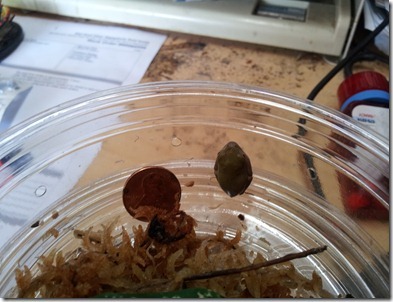 I did manage to score 3 tiny, baby Red Eye Tree Frogs. 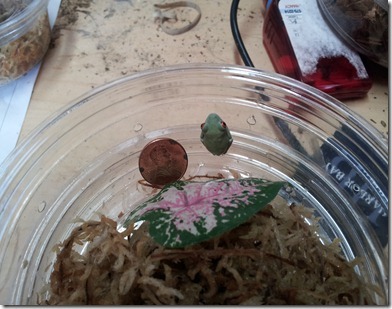 So here is one of the Red Eye Tree Frogs I purchased, the penny was inserted to give you an idea of just how small they are. They had albino ones but the price difference was just too much to justify purchasing them considering that I have had husbandry issues in the past and lost all the frogs in a colony. This species of frog is nocturnal and they really do only wake at night, when most of the lights are out. They live in the canopy of the rain forest where they hunt insects. Their Agalychnis callidryas translates to Beautiful Tree Nymph which really is befitting I think. I like this picture the best because you can see how they tuck themselves up in to a little ‘wad’ and sleep on the underside of leaves. In this way most people would walk right past them without realizing they were there since they blend in with the underside of the leaf. Finally, Haplo wanted an Emperor Scorpion and we have always made him wait because these creatures have a stinger and they can and will use it. Haplo will turn 9 this year and he has come a long way in the last two years when it comes to taking care of his pets. 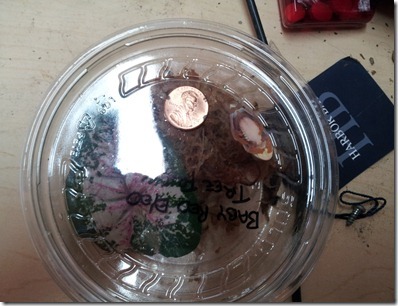 This will be the first real pet other then fish and roaches that we have allowed him to have on his own. This isn’t the greatest picture and I will try and get a better one to replace this one with. All in all it was a good show although I can tell that Chantix has a serious effect on my patience and on my anger threshold. It really put me in a foul mood that the ATM’s wanted to charge such fees and I almost opted to just come home. I realized that was a bit over the top reaction and how it would place all of it on Haplo and Kethry who really wanted to go to the show. 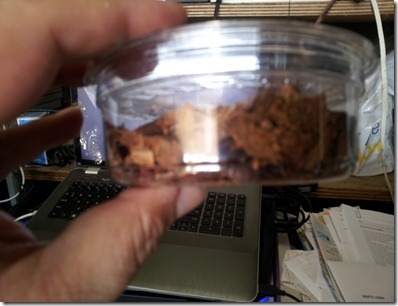 When I started to think about it, I really couldn’t understand why I was so upset to begin with and at the same time the craving for a cigarette hit like the munchies when going to an all you can eat buffet at 4:30pm. Later, when Haplo wandered away and I was unable to locate him, I again noticed myself getting extremely angry over nothing and had to think about why I was getting so angry and how I was going to deal with it. I think the next time we go I am going to make sure he has a Walky Talky or something like that so that we can communicate when he walks away. I can’t really get upset with him for it because I did it when I was a kid and I usually left it up to my parents to find me. The fruit really doesn’t fall far from the tree. Sadly, it is times like these, when I have these realizations that I so wish that I could call my Dad on the phone or sit down and drink a beer with him and talk about it. So that I could thank him for helping me to become the man I am and for not giving up on me when things got difficult like he could have. I know I will probably never get to talk to him again or see him again but it doesn’t make me desire it any less. I forgot about the incessant talking. We might have to play with them for a few hours the day before we actually plan to use them to take the novelty away.